Remember dear reader, the mixing of alcohol and automobile should be left to the professionals. Drinking and driving is the domain of cops, and metallurgists, and writers, and a few other selected individuals skilled in and comfortable with the venerable art. They met again in Superior Court, Douglas Ralford, electrical engineer of Long Beach, and Dr. W. R. Senseman, Lancaster hospital owner, and his nurse, Alma Carleton. The last time was November 4, 1946, when Vivian Ralford gave birth to an apparently stillborn son. Alma told Vivian her child was dead moments after his birth; seven hours later, wrapped in paper in the morgue, baby was heard to cry. He was hurried back to the nursery, where he died two hours later of exposure. The Ralfords were seeking $100,000 in damages, but reached a pre-court deal through Attorney S.S. Hahn and Senseman’s insurance company, believed to be in the range of $5000. And who among us is surprised to see…another nurse. Yes, I love their embittered hearts and unrepentant drug addiction and that I love their overblown need for role playing is an unfortunate matter of public record, but their fundamental incapacity to discern between “alive” and “dead,â€ thatâ€™s the part of nursing that weirds me out. But Ralford Jr. roseâ€¦like Lazarus, with Nurse Almaâ€™s bidding? Or did the liâ€™l revenant self-resurrect, rolling his rock away from the entrance of the morgue? In any event, pointless theological speculation aside, Junior up and dies again, making him some sort of undead I Am Legend spawn. All in all, the question remains, whatâ€™s a dead baby worth? Above and beyond the nine months of minimum wage that is your due? The Ralfords asked for 100k and settled for five. Telling. Of course, kid would have grown up to be one of those self obsessed boomer types. Ahem. This much we know with certainty: screams from a morgueâ€”thereâ€™s a sound you won’t soon forget. FLASH: Here’s the piece in handy MP3 format. Nathan and Kim are back on the air this week in a moody mood piece scribed by KNX investigative reporter Michael Linder, the L.A. Press Club’s 2004 Radio Journalist of the Year. You can hear our spot throughout the hourly news round ups either on Thursday or Friday, and probably thoughout the weekend, on KNX-1070 AM. The peace of little Sharon Lee Christensen’s sleep was shattered tonight when a late model sedan crashed through the wall of the 5-year-old’s bedroom at 8852 Cynthia Street and came to a stop atop the child, with only her mattress protecting her from certain death. 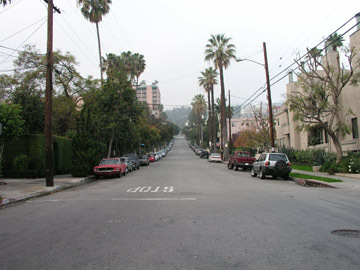 The incident began when Lucille Bianchi, 20, a nurse, parked her car on a steep grade on Larrabee Avenue near Sunset Boulevard. The car rolled free and Lucille hopped onto the running board, struggling frantically to get inside and throw the brake. 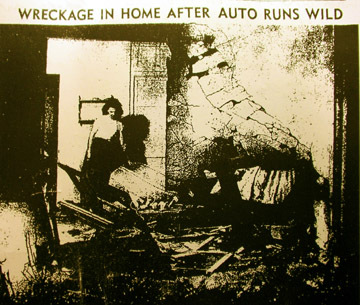 Before she could, the car smashed through the Christensen’s wall, with Lucille along for the ride. She was taken to West Hollywood Emergency Hospital with a possible broken pelvis. Sharon Lee, meanwhile, went to sleep in a less drafty part of the house. I donâ€™t buy it. Not for a minute. –no. I stand by my estimation of 19 December (uh, and of 21 December) wherein I take nursing to task. At the risk of conjuring the ire of the American Nursing Association, I put it to y’all, that Lucille â€œRegistered Nurseâ€ Bianchiâ€™s auto was somehow bewitched by saidâ€™s nursing powers. That which can be equated with nursing invariably invokes madness, mayhem and death. Prove me wrong, ANA? Didnâ€™t think so. Yeah yeah, leave nurses alone. Nurses see more death than doctors. Hell, nurses see more death than do most Army sergeants. The only gals who see more death than nurses are lady morticians. He didn’t obey the boulevard stop, so cops pulled him over. Donald I. Smith, 50, sat in his car in front of 1640 S. Robertson and eyed the rearview as the officer walked towards him. By the time the man reached the car, Smith was slumped over the dash with a bullet in his head. He died an hour later in Santa Monica Hospital. File under: you’ll never take me alive, copper. It didn’t take long to determine that Smith was the man wanted for kidnapping his 14-year-old stepdaughter Sheila Shirley Marilyn Morrison from her aunt’s place in Leucadia on Christmas. The girl had already been found safe in a hotel in La Mesa. No one bothered to check to see if Nebula M-17 burned a little dimmer in mourning. Some of us travel with license and registration handy, others with the requisite â€œIâ€™m dead, so blow meâ€ note. Such missives are necessary for those of us actively sought for the abduction of our 14 year-old stepdaughters. History does not record what transpired between the two from the moment of Sheilaâ€™s abduction and her discovery in that hotel, but if it was worthy of daddyâ€™s suicide, we can assume it was nothing good. Had Donald rolled down the window of his Nash, or Plymouth, or Hudson, as the bulls approached? 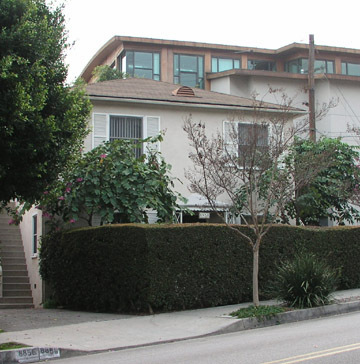 Did the folks within this handsome collection of prewar apartments hear a muffled pop, or a startling crack? Could Sheila-Shirley feel his head explode, wherever she was? Each family celebrates the season in their own way. Some have carolling and stockings, some make a respectful visit to church, others opt for Chinese food and a double feature. Glenn Hepner, 43-year-old upholsterer, honored Christ’s birth by picking up a stranger, Alonzo W. Boren, 61, and bringing him home to 2831 S. Orange Dr. for a drinking party. 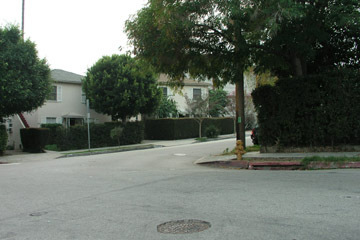 Hepner’s wife Anna retired early, leaving the two men to their tippling and horseplay, and in the morning found Glenn dead on the bathroom floor. 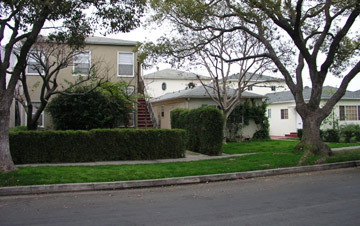 Rousted at his home at 724 N. Fairfax, Boren admitted he’d been fighting with his host, and had left him in the bathroom. An autopsy is pending. 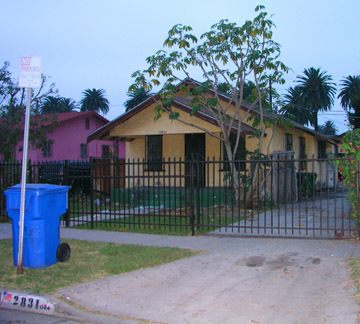 The archetypal California bungalow, thick braces under low-pitched double gables, sent to hell via the stuccoman. The neighborhood reeks of stucco. And booze. And corpses. It is Christmas, after all. In any event. 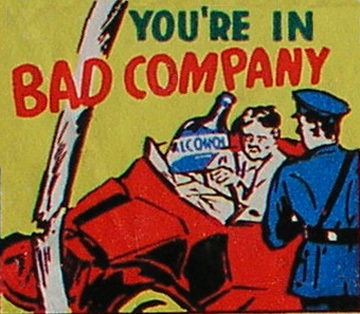 The drinking party: you drink, you get drunk, somebody dies. That‘s a party, you computerized pansy.